is a streamlined, easy-to-use work flow of ordering, receiving and counting inventory, followed by metrics to help your team move the needle. Easiest back office system + Most detailed data = Highest value system in the industry! Detailed COGS reports show inventory values based on FIFO methodology. Ingredient-level reports by day, week or period help you strive for perfect performance. 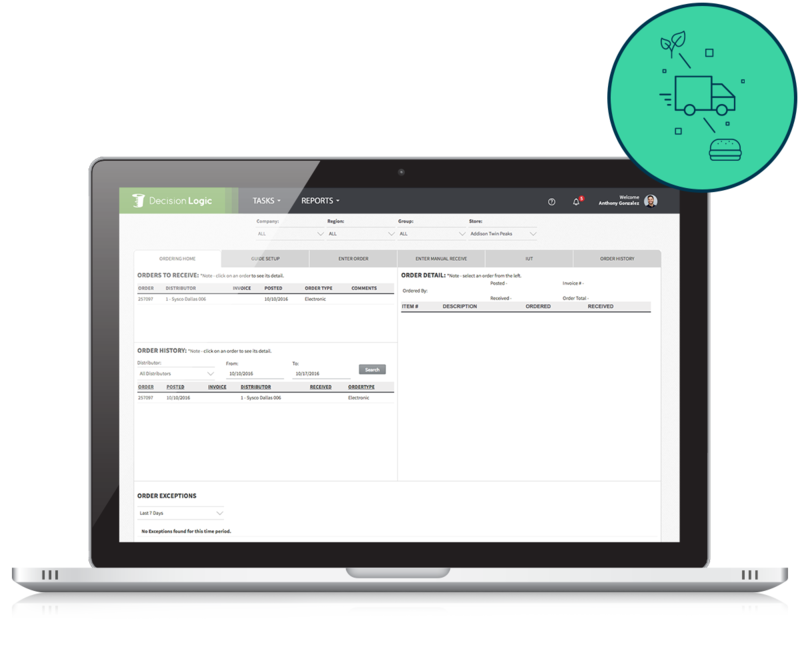 Flexible receiving, better planning with predictive analytics, and mobile tools for ordering, inventory and more. Tracking distributor performance using Distribution Center Report Card to ensure ALL orders are fulfilled consistently and that you’re being charged correctly! Predictive Analytics reducing the learning curve for orders and prep. No more using the force! Decision Logic’s Inventory & Ordering platform handles the ever-evolving menu changes and supply chain fluctuations common in the hospitality industry. We make teams more profitable, allowing you to continue doing what you do well – running your restaurants. Optimized for multiple concepts, menus and distribution models, the Inventory & Ordering system provides a clear and true understanding of inventory performance. Want to see Decision Logic in action?